One of the most famous aircraft ever built is the Douglas DC-3 and its military variant, the Douglas C-47 Skytrain or Dakota. Originally called the DST or Douglas Sleeper Transport, it first flew on 17 December 1935. With a range of 2,400 kilometres and a cruising speed of 333km/h it was considered both fast and long ranged for the era. American Airlines put the first aircraft into service on 26 June 1936. Following on from last weeks video about the Breguet Deux-Ponts, this week we return from France and look at the Douglas DC-3. Below is a 25 minute short film narrated by C.R. 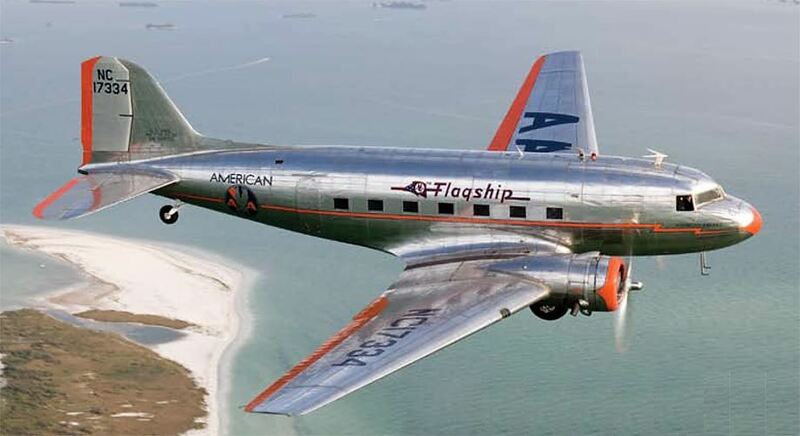 Smith of American Airlines called Flagships of the Air, which was released in June 1939.
Who is C.R. Smith? He was the CEO of American Airlines and the one who persuaded Donald Douglas to build the DC-3 in the first place. He found the existing DC-2 was too narrow for side by side sleeping berths and convinced Douglas to develop a wider and better aircraft. The most interesting parts of the film for me is 02:00 to 15:20 and then 22:25 onwards. You can really tell the film is from 1939 as it mentions how the route network connects to the “Yankee Clippers” on one side of the country and the “China Clippers” on the other. These are the Pan American flying boat services to Europe and Asia, so I enjoyed hearing that mentioned. Something that amused me is how it is pointed out that Chicago is very busy with 96 flights per day. Their minds would be blown if they knew that today Chicago sees more than 2,400 flights each day. Other highlights for me are breakfast at 13:20, sleeping berths at 14:35, and a few seconds of the Normandie ocean liner at 22:35. The Douglas DC-3 is credited with making air transport popular in the United States. Over 400 of the 607 passenger aircraft were delivered to US airlines. Other early operators included KLM who replaced the DC-2 with it on the services from Amsterdam to Sydney in 1936. With 10,048 military versions, and with another 4,937 and 487 produced under licence in the Soviet Union and Japan respectively, you could find the DC-3 virtually everywhere. An old saying goes that the only way to replace a DC-3 is with another DC-3! Have you every flown on board a Douglas DC-3? Is it as quiet inside as they try to make out in the film? Thank you for reading and if you have any comments or questions, please leave them below. Featured image by Jim Koepnick via Vintage Airplane, September 2006. I imagine you’d get some amazing views flying from West Palm Beach to Grand Bahama, especially as they didn’t fly that high! You really have some serious DC-3 experience there and you’re right on it being wider than the DC-2 to carry more people. I’d forgotten it was called the gooney-bird as well – it’s definitely an aircraft that people remember fondly. I’m glad you noted it was noisy – I don’t think any aircraft of that era were particularly quiet inside. Great stories there – really enjoyed the read! Thank you! Love how the ticket agent is up-selling the passenger into buying a ‘hidden city’ ticket (see 19:07-19:45), explaining the advantages of buying and deliberately not flying the last portion of a single round trip over two separate tickets to ultimately reach his desired final destination, all with no threat of having his [still decades from being offered as a perk] Oneworld account revoked… Those were the golden days of aviation; and it would seem, as well, the golden days of airline customer service! Hahahaha! Well spotted – that’s something that’ll certainly get a few eyebrows raised if you do it too frequently today. I liked that customer service part and how he had to make a call to reserve the seat. Definitely a different time, but at the end of the day, not all that different. These films are always fascinating, I feel. Thanks for the comment! You have some really fantastic memories there! I’ve always wondered what it would be like to climb up the slope to get to your seat due to the tail dragging configuration of the DC-3. I can imagine you were treated very well at such a young age and it certainly sounds exciting. I’d say that it definitely had an influence on your Air Force career. Thanks for sharing all of that, I enjoyed reading it! It is was quite noisy, but also awesome, acceleration was not overly impressive even when lightly loaded. Then again I flew C-47s and they didn’t have any soundproofing. But I can only guess that any wadding on the walls wouldn’t cut off too much noise. The growl of those engines was something to behold! I expected it to be pretty noisy inside, despite the film of the time making it seem like it was quiet. I can imagine with the C-47 it would have been worse. Great that you had the experience of flying them, that’s pretty cool. Hopefully I’ll get to fly in one someday and experience the sound for myself. Thanks for the comment! My very first flight was in 1967 when I was 18 months old on an Ozark Airlines DC-3 from Peoria, Illinois to St. Louis, Missouri with a stop in Springfield, Illinois. Of course I have no memory of said flight but Mom says I had to sit on her lap as we were non-revving and there was only one seat available! 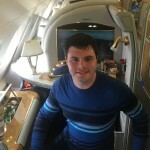 That’s pretty awesome that your first flight was on such an iconic aircraft. Shame you don’t remember it though, but I’m sure it was fine. I imagine your Mom didn’t mind too much as you can’t have been too big at 18 months!